Time flies so fast. Today mark the fifth year when our little princess was born. Today is her actual birthday although we celebrated it earlier to take opportunity of the four day weekend. Below are the five years milestones of our daughter Rylie. When Rylie turned one year old, we were still living then at my FIL's house and I didn't have many friends yet.l It was a simple and yet meaningful celebration as we celebrated it with John's family. Her second birthday was celebrated at my brother-in-law's house. 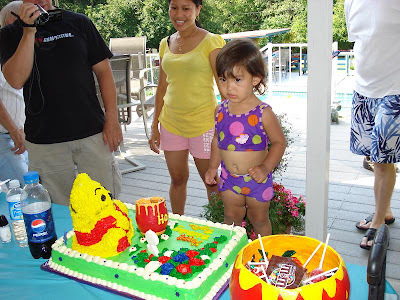 We decided to have her birthday there because they have a swimming pool and my BIl has huge yard. Adults can play volleyball, horse shoe, and he also has a pool table and darts. It was really a fun celebration. She turned three when we were in Korea. We invited some Filipinos and other friends that we met inside the base. It was fun especially on the second day when the two gave me a surprise (second pic). I went to our neighbor real quick to return a dish and when I came back, they tore up the left over cake lol. Her 4th birthday celebration was very memorable as we celebrated it in the Philippines. Although it was coupled with a tragedy due to my brother's death. We really don't want to celebrate it there since it was a couple of days after my late brother's burial. But we want her to experience how is it like to celebrate a birthday in there, especially with a lot of kids around. 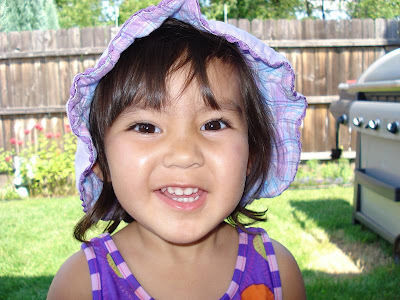 Here is she now, five years old. You may peek at how we celebrate her birthday at the bottom of this post. We love you very much princess. Happy birthday! We would like to thank the Dias family for sending us a package today, a perfect timing on Rye's big day. Thank you guys! Oh wow... Rylie looks so pretty! Happy birthday to her! by the way, i hope you can see my post this time.. i put it in the mommy journey already.. Happy Birthday to Rylie. Time flies so fast, and our kids grow before our very eyes. That was a nice collection of pictures Rose, it's priceless. wow, Rylie is getting prettier each year. again, happy birthday Rylie! hugs and kisses from the Dacios. She was so pretty...Rylie gorgeous..Happy Belated Birtday!! Happy B-day to your little princess. Lalong gumaganda as she grow older,bka sumakit ulo ni daddy sa dami ng admirer nya pag dalaga na. LOL.. Happy Birthday to your princess,Ate Rose!Lalo pang paganda ng paganda ang munting dalaga mo^_^Best wishes po! dalagang dalaga na si rye sa last pic. How time flies! Before you know it, you have a teenage daughter na! Happy birthday, Rylie! I also have an award for you, Mommy! OhMyGosh! The last picture of her - she looks like a young lady instead of a little girl or a baby girl! Isn't it amazing how fast they grow up? Happy Birthday Rylie. She grown so fast sis.. and she looks prettier when she gets older hehehe! You are growing up so fast. :) It does not matter though as long as you always stay pretty always. Happy Birthday Rylie! She's getting prettier and prettier na talaga sis now that she's growing up! waaaa.. di ko alam kung succesful comment ko at nag error..ang haba pa naman ng comment ko parang entry na sa blog.. hihi.. anyways. to sum up..balik ako tom for my entry, naka draft na, la pa lang pic..sowi po late ulit ako hihi..
read your update about homeschoolling, you're doing your job well mommy! buti nga late ko na nadiscover ang blogging, kundi baka di ko naturuan mga anak ko ng ABC.. hihi. and rye, naku, di mo mapansin, maya lang teenager na.. Please check out nga pala may entry sis: My True to Life Story of Aswang/Manananggal. Hi Rose! Laki na ni Rylie! For all you know, mabibigla ka na lang na marami ng boys ang aaligid sa iyong magandang dalaga! Happy Birthday! ang gandang bata ni Rylie. awwwwwwww.....time goes by like a lightning...ehehhehe! she is indeed a pretty little lady...mana sa ina eh....ehehehe! 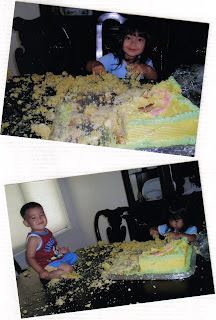 I love all the pics...lalo na yung cake explosion...ehhehehe....magkakuntsaba talaga tong dalawa...ahhahaha! a quick dalaw here sis...maya na ako blog hop...the movers will be here on the 22nd....and I guess we are leaving on the 23rd...waaaaa! Belated Happy Birthday to Rylie! Oh my, you got there a very beautiful daughter. No doubt she'll be a stunning lady someday. Sorry hon, my entry is late. My midterm exam is stressing me out lol. I think you will like what my entry is. Happy birthday princess, hope that you will grow up smart and respectful. Remember that Mommy and Daddy are just here to support whatever you want to be in life. We love you very much! PS.. 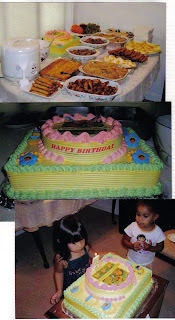 I really love that cake disaster photos lol. Rylie is so beautiful! Happy birthday to her all the way from Malaysia! Rylie really had great milestones in her life. Time flies so fast and our little princess is growing up to be a pretty lady. She will be attending her kindergarten next month and soon she will be in a regular class. Soon she will be attending her Jr. and Sr. Prom and then later on her debut. 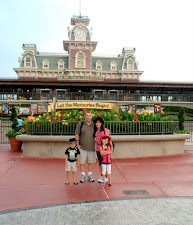 Through it all, we will be witnessing her different milestones through your blog. Thanks for the nostalgic post. God bless you all always. 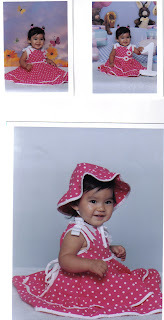 Hmm, pansin ko lang parang puro pampaswerte damit ni Rylie during her bday, polka dot then Chinese clothes..hehe,..
She is so cute, Happy Birthday to ur princess Ateh... love the tore cake, hehe pasaway! I hope next time on time na ako. Thank you always for the visit.I know ang dami ko ng atraso sa yo but the you keep on visiting me. Oh how time flies, laki na ni rye and she is a good kid. joe admired how good Rylie is. Happy Birthday princess. was here..hihi.. i shall return.. sowi po mommy rose.. save the best for last talaga.. hihi..